Delivers spectacular rhythmic multiband filtering, albeit with little in the way of fine control. A simple but effective idea. Great sound, huge fun. Ridiculously easy to use. Artemiy Pavlov's Sinevibes label has made a name for itself producing budget-priced, succinct plug-ins positioned at the more creative, experimental end of the market. "Array takes a complicated concept and boils it down to a minimalist set of controls." 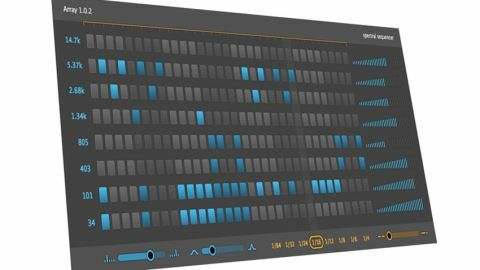 Artemiy's latest toy, the Mac-only Array, is a step sequencing multi-filter that takes a clever and potentially complicated concept and boils it down to a super-minimalist set of controls. Indeed, the bit of the manual that deals with operating the thing is just two pages long! Array comprises a bank of eight parallel -36dB/octave resonant band-pass filters, each with its own output level control. The centre frequency of each filter can be set to up to double its lowest point - so, the first covers 20-40Hz, the second 60-120Hz, the third 240-480Hz and so on - apart from the eighth, which ranges from 12-16kHz. However, what's important to note is that all eight can only be adjusted as a group (using the bottom left slider), rather than independently - the whole bank moves up and down as one entity. The same goes for the resonance, which can also only be set globally for all eight filters. The filters are switched in and out (out meaning silence, rather than the dry signal bypassing the filter) by the up-to-32-step sequencer that dominates the interface. Steps are clicked in individually or 'painted', and the grid resolution can be set to a range of note divisions, from 1/4 to 1/64. Swing can also be applied, either for purely creative effect or to counter the inevitable transient glitches that occasionally crop up when slicing drum loops. The upshot of all this, then, is a combination of sequenced gating and filtering that chops up the input signal in both the time and frequency domains. In essence, it's a multiband trancegate. "It even proves effective on full mixes, for breakdowns, loop reductions and other filter-based manoeuvres"
Drum and percussion loops are spectrally repositioned and rhythmically 'reprogrammed', while basses, vocals and sustained melodic sounds are transformed into funky, eccentric, tonally pruned grooves. The broader the incoming frequency spectrum, of course, the more meat the filters have to chew on, and Array even proves effective on full mixes, for breakdowns, loop reductions and other filter-based manoeuvres. With the exception of the step buttons, everything you see in the GUI is a potential automation target, including individual band volume levels, which considerably ups the dynamism. The dry/wet mix balance is also automatable, although why this isn't a visible control, we're not sure. Our only other issue is the inflexibility of the filters - it would be great to be able to adjust frequency and resonance settings independently, and a few more filter slopes wouldn't go amiss, either. Oh, and basic control over the envelope release for each step would solve the percussion transient clicking issue. And a few assignable LFOs would provide more immediate modulation than host automation. Were Array more expensive, these things would be a little irksome; at this price, though (and bearing in mind Sinevibes' stated aim of balancing ease of use and practicality against feature overload), a certain level of 'take it or leave it' has to be accepted, and with that in mind, its tight focus, superlative ease of use and impressive sonic results really can't be faulted.